The following is a step-by-step guide for installation of your new sod. We'll guide you from grass delivery to getting your turf planted. 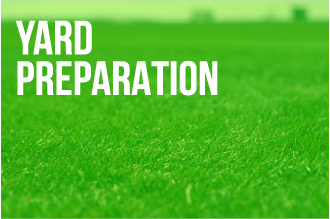 After following the guidelines found in our Yard Preparation Guide, you’re ready to install. 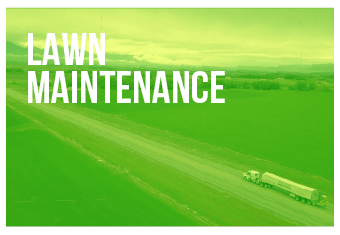 For long-term lawn management please refer to Raft River Sod Lawn Maintenance Guide. Let the driver know where you would like pallets places. A minimum of 10’ opening is required for our drivers to access the yard with our forklift. Each pallet is a 4’x4’ with 520 sq ft. of sod. Be sure you have the driver set the panels a few feet outside of the area to be covered by that pallet, so that the pallet does not interfere with the installation. Just before laying each row of sod, rake out any low spots, footprints, or forklift marks. Start by laying the sod end to end along a straight line farthest away from the entrance to your yard. Complete one row from the starting point to the end of the property. Return to the starting point and begin your 2nd row with a half piece. Lay several pieces in the second row. Begin the 3rd row with a full piece, the 4th row with a half piece, the 5th row with a full etc. Continue this pattern throughout the installation process. You will notice a “stair step” pattern forming. Lay a piece on row 2, then a piece on row 3, then row 4 etc. This allows one person to stay on their knees, placing the pieces as they follow the “stairs” to the end. While another person carries rolls from the pallet, dropping the “tail” of the roll close to the end of the piece already in place. (This process helps eliminate excessive bending and kneeling). Pull each piece tight against the pieces before installing the next piece, avoiding gaps and overlaps. Install sod by sprinkler zones. As soon as a zone is completed. Turn the water on that zone. One person can be trimming (a sharp knife is adequate). When laying sod against cement edges, lay sod over the top of these edges and use the cement edge to cut against, leaving a perfect match of sod to cement. Avoid leaving small pieces or strips on outer edges. (Small pieces shrink and dry out). On slopes place the sod pieces across the slope. Start at the bottom and work your way up. Sod must be watered within ½ hour of installation.A light spray is not sufficient. At least 1 inch of water should be applied ASAP-measure it to ensure the sod will not go into shock, if it does not receive adequate water soon enough, it will turn yellow first before it greens up. A simple method to measure the amount of water being applied would be to place straight-sided cans, cups or pans around the yard. After watering, measure the amount of accumulated water in the can, with a ruler, if it is at least 1 inch you can stop, if not, continue. Water your new sod ½ inch per day for the 1st week in hot weather, ¼ inch in cool weather. After the 1st week, monitor the frequency of irrigation by lifting a corner of a couple of sod pieces, if it is wet, wait to irrigate. If it is slightly moist, apply at least ½ inch of water in hot weather, ¼ inch in cool weather. Rain can be counted in the amount of water applied, but it must be measured. People often think that rain is sufficient. We seldom receive enough rain, to keep from using the sprinklers. After 3 weeks of watering, cut back on the frequency of water application. Continue to put a minimum of ¼- ½ inch each time you water, but not as often. Take care of your lawn with confidence. Read our tips for fertilizer, water, weed, and pest control. Proven steps to give you the most beautiful, long lasting yard possible preparing your yard for sod.